Published by C.F. Peters Corporation (Edited by Zeltsman). Released in 2009. Available from Steve Weiss Music. 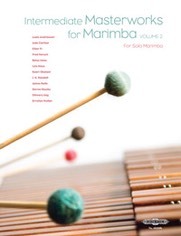 A historic collection of marimba works aimed at bridging the gap between idiomatic etudes and virtuosic "warhorses" thereby meeting important needs of both students and concert performers. The 24 pieces represent a wide range of compositional voices and musical styles. Volume 2 contains 12 works by: Louis Andriessen, Jude Carlton, Chen Yi, Fred Hersch, Betsy Jolas, Lyle Mays, Kaori Okatani, J.K. Randall, James Rolfe, Steven Stucky, Chinary Ung, & Errollyn Wallen. More at: ZMF New Music.